Steve registered as a pharmacist 36 years ago, and has recently retired. He hopes to spend more time pursuing several hobbies that he didn’t previously have time for. His passion for cycling started in 2012, when commuters in London were advised to avoid the underground and public transport due to the Olympics, and he took to walking or cycling to and from the office. 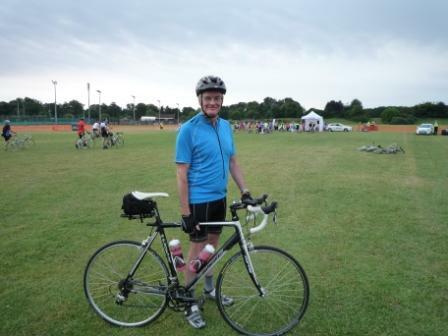 In July he took park in the Prudential Ride London 46, which was a 46 mile bike ride from the centre of London to Richmond and back again, and has so far raised £500! I was fortunate to be appointed a trustee of Pharmacist Support earlier this year, and already knew of the good work of the organisation. I now understand more about the importance of fund raising and thought I could benefit us both by exploiting my hobby of cycling in a suitable charity ride, with the proceeds being used to invest in the support services of the charity. My final time was 2 hours and 47 minutes. As one of the very last ‘wave’ of riders, there were very strict time limits to observe as the organisers must reopen roads to traffic. Failure to reach specified checkpoints in time could have resulted in the race marshals stopping me from going further. The final time at the finish was to be 12:49 so I aimed to finish before this! The ballot for next year’s Prudential Ride London opens in a few days, and I will be applying! I have also entered into another organised ride in September and am considering one in October – I think I have the bug! You’ve raised a fantastic amount of £500, what would you like to say to everyone who has sponsored you? I originally set a target of £175 as this had a nice ring to it. But that was soon exceeded, so I lifted the target. All my sponsors have been incredibly generous, and whilst many are pharmacists and therefore know of the charity, others are not linked to the profession at all – but still agreed with the need to support pharmacists, their families and pharmacy students. To all of my sponsors I say thank you on behalf of the recipients of the support that can now be provided by the charity, but thanks also for encouraging me with this challenge – it was a memorable day! Having been in the profession for 36 years, and had extensive contact over the years with the organisation and some of the pharmacists who have needed a helping hand, this charity is very high on my list to support. I know of no other charity that better focuses on the special cases involving pharmacists, their families and students.